Where Does Kiwi Come From? This Is Superb, Like Super! / Where Does Kiwi Come From? This Is Superb, Like Super! Kiwi is a term that refers to both a type of fruit and a native from New Zealand. Does that mean this fruit comes from New Zealand? Or is it originated from a different country? 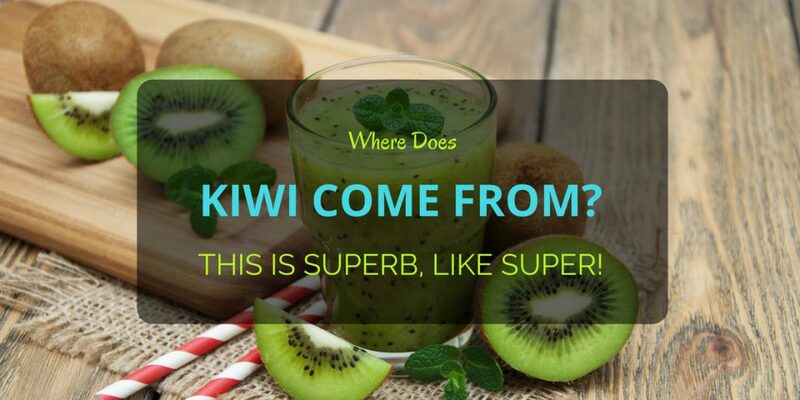 If so, where does kiwi come from? Where Does Kiwi Come From? Kiwi has a scientific name “Actinidia Deliciosa” or “Actinidiaceae”. Its other common names are kiwifruit, Chinese gooseberry and Yang-tao. With those names, I think you can guess where does kiwi come from. This fruit has a few varieties. The most common is known as hardy kiwi, otherwise called as “Actinidia Arguta or Actinidia Kolomikta. Others are red kiwi (Actinidia Melanandra), purple kiwi (Actinidia Purpurea), silver vine (Actinidia Polygama), and Chinese egg gooseberry (Actinidia Coriacea). In the US, hardy kiwi grows from zones 4 to 8. This variant produces small fruits without fuzzes. That means you can eat it with the skin. Some hardy kiwis can pollinate by theirselves. This particular plant can grow from 20 to 25 feet long. It is easily identified through its twining vines and smaller fruits. Fuzzy-skinned kiwi is also a favorite specie of this plant. Compared to hardy kiwi, this one grows in zones 8 to 9. It is taller reaching a maximum height of 15 up to 30 feet with a width of 6 to 10 feet. Its fruit is a bit larger and very fuzzy. It has larger and heavy vines, which is why a strong and sturdy arbor with overhead frame or wall is needed for support. Where does kiwi come from exactly? This fruit is native to east Asia. It originated from China, particularly in the Yangtze River valley, which is on the north part of the country, and Zhejiang Province on the east. How does this fruit end up in New Zealand that imports in most countries all over the world? Missionaries brought the first seeds of this fruit from China to New Zealand. Among the people responsible are Hayward Wright, Alexander Allison and Bruno Just, who were regarded as the early nursemen of this fruit. Nowadays, this fruit also grows from other countries, such as Chile, Italy and South Africa. Growing kiwis may be a challenge for beginners. This kind of plant requires a very long season before it produces fruits. It takes around 240 days without frost. They need to be fully dormant first before the first weeks of fall or autumn start. They can overcome cold temperatures to about 10-degree Fahrenheit or else they won’t produce enough fruits due to cold freezing climate. These days it is easy to identify a kiwi fruit. Its oval or ovoid shape may not be rare but its brown skin is distinctive as it has short, stiff, brown hairs. When sliced, the flesh part is bright green with a big white spot in the middle surrounded by black or dark purple seeds and a symmetrical off-white pattern. It’s actually looking pretty and inviting. The taste is a combination of sweet and tart, but this is acidic. Overall, it is juicy and sumptuous. Does it even matter now where does kiwi come from? Kiwi tree has thin, long stalks but its foliage can be heavier that’s why a support is always needed. The leaves, which are large and dark green, leathery, are oval in shape with a diameter size of 7 to 10 inches. While still young, the leaves along with the shoots have red hairs. The mature ones are hairless and darker green. Like in most plants, flowers of kiwi are the best hint that indicates fruits start to grow soon. When they appear, they bloom in white to cream with cool scent. You can see this beauty in singlets or triplets in the leaf axiles. The blooming period of kiwi flowers start in May and end in June, in short spring season. It produces male and/or female flowers, which are both needed in order to product fruits. Kiwi is typically not that easy to grow. Regardless where does kiwi come from, you need the seeds in order to plant, grow and harvest fruits. It’s extremely important to consider the weather conditions, soil and location. It relies on acidic, well drained soils, organic matter and adequate water. As for sunlight, it doesn’t necessarily have to be placed directly but in shaded yet sunny location. We have learned where does kiwi come from. It’s not entirely from New Zealand but China. Yet, it’s the former that does most of the production and importation of this amazing fruit. Did you find that surprising? ​What Plant Does Kiwi Fruit Come From?